Yes it’s true. The ‘made in India’ label is getting plenty of takers across the globe. From garments to handicrafts and from dosas to cars, Indian products are gaining recognition and acceptance like never before. And the latest case is of the ‘Tonight’s Show’ host & comedian Jay Leno, who added the world’s cheapest car, the Indian born and bred, Tata Nano to his huge collection of cars. 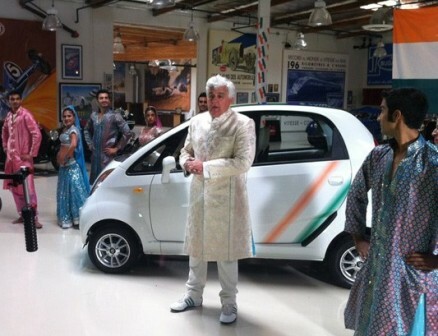 One of the biggest petrol heads in the world, Leno has a 17000 sq.ft. Garage with almost 200 cars, many of them vintage, exotics, classics, and custom built and 90 motorcycles! Leno, a famous comedian, fell in love with one of the smallest cars in the world, the Nano and welcomed the vehicle into his Big Dog Garage in true Bollywood style. 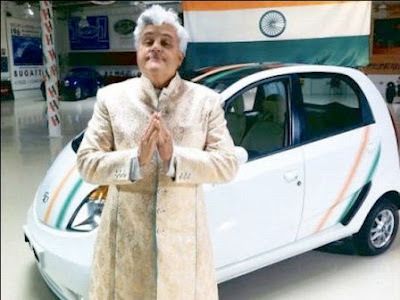 Dressed in an embroidered cream colored ‘sherwani,’ Leno greeted everyone with a Namaskar as he stood against the Indian tricolor in the backdrop. Further “Indianising” things, was a group of Bollywood dancers wearing shiny lehengas and shaking their legs to popular Hindi film songs. The white-colored Tata Nano has the Indian tri-color painted on its body reflecting its Indian spirit! 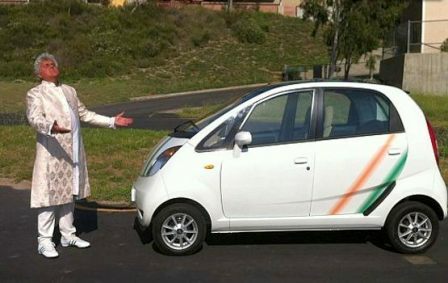 Here’s hoping that Leno with his latest acquisition enjoys riding it and pray that his Tata Nano doesn’t blow up anytime soon.